Since its founding in Silicon Valley in 1962, SIMCO has always placed top priority on providing the highest quality technical services and receiving accreditation and certification to national and international quality standards. DEKRA Registered Quality has certified that SIMCO meets the requirements of ISO 9001:2015 with the scope of calibration, repair, and testing of test equipment, process instruments and equipment, and measuring instruments and equipment. SIMCO's ISO 9001:2015 Certificate can be viewed here or on any of our Lab Locations pages. 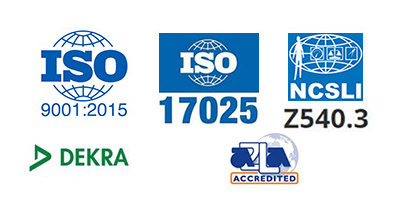 Numerous SIMCO commercial laboratories are accredited by A2LA to ISO/IEC 17025:2005 - general requirements for the competence of testing and calibration laboratories. SIMCO's Scope of Accreditation for ISO/IEC 17025 can be viewed for each SIMCO lab on our Lab Locations pages. and the traceability of measurement results to the International System of Units (SI). SIMCO's Scope of Accreditation for ANSI/NCSL Z540-1 and Z540.3 can be viewed for each SIMCO lab on our Lab Locations pages. Learn more about SIMCO's Quality Management System.